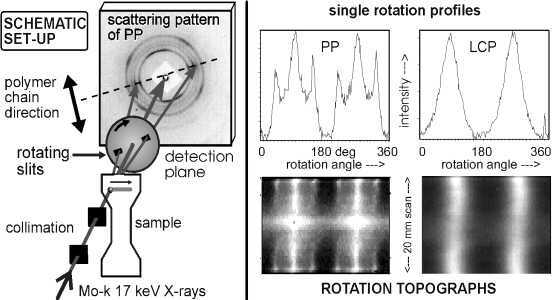 X-ray topography is characterized by the spatially resolved detection of scattering of a sample. It combines both the advantages of radiographic imaging and the analytical information of X-ray scattering like wide and small angle diffraction, refraction and total reflection. Scanning techniques under small and wide angle scattering conditions permit the topographic characterisation of any crystalline or amorphous solid or liquid. New topographic methods and applications to non-metallics are presented. The tasks of non-destructive characterisation of materials are related to the finding and application of structure/property relations, of correlations between atomic, meso and micro structures with macroscopic properties. X-ray topography can contribute to many solutions, as the structural selectivity covers a range of six orders of magnitude, from 0,1 mm to 0,1 nm, based on different scattering effects. The spatial resolution up to 10 µm is achieved by scanning techniques under preselected scattering conditions. It provides good detection of single defects for classical NDT tasks as well. Historically X-ray topography has been applied to single crystals since several decades . The classical methods however do not permit the inspection of polycrystalline materials which represent the majority of materials. Crystal dimensions, interface topology and texture influence the mechanical properties of materials significantly. X-ray topography can easily contribute to reveal such correlations and exploit them for Advanced Materials development, for quality assurance or micro damage analysis. In the following X-ray topographic methods are explained and examples of investigations on advanced non-metallic materials are given. The extension of single crystal X-ray topography to polycrystals, amorphous solids and liquids has requested some new methods. 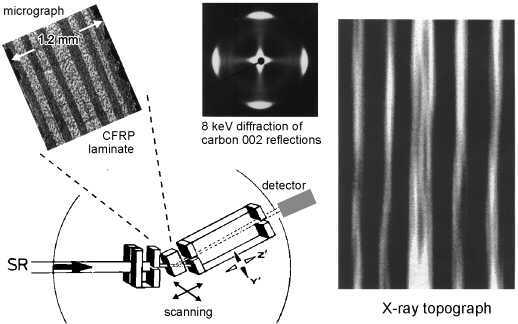 X-ray topography is based on Wide Angle X-ray Scattering (WAXS) and Small Angle X-ray Scattering (SAXS) respectively, as well known from classical crystallography. Typical X-ray sources are X-ray tubes for fine structure analysis. They provide monochromatic radiation of high brilliance at 0.07 or 0.15 nanometer (nm) wavelength (~17 keV Mo-k-a and 8 keV Cu-k-a radiation). Wide Angle X-ray Scattering (WAXS) (diffraction) is elastic scattering (no energy shift) and is sensitive to the atomic and molecular structure below the scale of nanometers . The Scherrer diffraction patterns of carbon and polymer fibers are typical examples of anisotropic scattering, which is a good precondition for orientation measurements (Figure 1). The usually sharp line spectra are analytical probes for the chemical and molecular constituents. Scanning a sample makes the spatial distribution of different matter detectable. Small Angle X-ray Scattering (SAXS) is a classical tool of colloid, polymer and biological research. Particle dimensions smaller than 50 nm are determined by 'Guinier' and 'Porod' analysis (diffraction) , larger ones by refractometry [4, 5]. Similar to WAXS of some polycrystalline materials, SAXS of fibers and wires reveals their orientation, as they refract X-rays like cylindrical lenses do with light. Typical scattering patterns of composite fibers are shown by Figure 1. In order to image the spatial distribution or orientation of the structures, a sample is scanned, while only a selected sector of the scattering pattern is pointing at an X-ray detector window. Figure 2 shows the basic beam and scan arrangements for different topographic methods of selective structural contrast and projections. They have in common, that the scattering geometry is first preselected and adjusted and then the sample is scanned within two dimensions, rotation included. The high quantum efficiency of scintillation counters permits the intensity measurement at reasonable speed. A standard PC controls the X-ray counters and the micro drives. Scanning topography makes use of X-ray scattering at the atomic structure of the material into discrete diffraction angles. According to figure 2 (top, left) a scattering angle and direction is selected (typically between 5 and 50 deg.) and the samples is scanned within the surface plane. The intensity at each scan position is stored by the computer. The reconstructed computer image reveals the spatial distribution (projection) of the material according to the setting of the scattering angle. The instrument contains a pinhole collimator of 1 mm diameter or smaller. The scattering angle and direction are defined by a window in a lead screen in front of the detector. 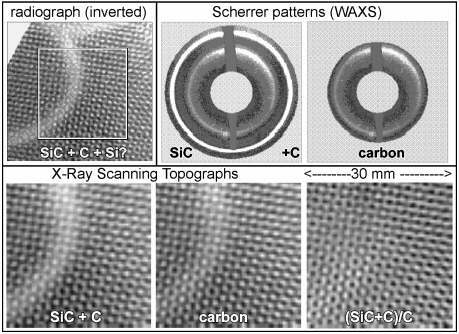 Fig 3: Investigation of C/SiC - CMC by X-Ray Scanning Topography; insert area of radiograph corresponds to topographs. For further explanation see text. The radiographic (inverted) image of Figure3 shows the transmission X-ray intensity due to density variations of a brake disk section. The fine tetragonal structure of 2 mm periodicity is related to bundles of the carbon fiber fabric laminate. But it does not explain, whether porosity or the changing SiC/C-fiber ratio creates the density fluctuation. Further more the radiograph contains a large circular sector flaw of unknown origin. The indicated area is inspected by Scanning Topography. At first two Scherrer diagrams of the sample are taken at different scattering angle intervals. The limiting scattering angle is selected by an adjustable diaphragm in front of the film plane. One diagram contains the scattering rings of both, SiC and carbon fibers, the other contains only the carbon 002 reflection (Figure 3, top). For the topographic scans the film is replaced by a large area detector. The sample is scanned twice at the two scattering angles and at 0.5 mm steps in both dimensions. Such a scan takes between a few minutes to an hour, depending on the desired signal to noise ratio (for standard X-ray tubes). The two resulting intensity distributions for both material selections look very similar (Figure 3, bottom) and similar to the radiograph. This indicates, that the density variation dominates the scattering variation of the Topographs. Solely the ratio of the two topographs is free from density variations, as these are the same in both. The resulting ratio image (Figure 3, bottom right) shows the mass ratio (SiC+C)/C. The fine periodic pattern has inverted. Bright positions indicate higher scattering intensity of SiC. They correspond to the dark positions of the topographs (and the radiograph) because of the higher absorption factor of SiC. The resulting topographic ratio image gives unique information for evaluating the mixing behavior of the two phases. It also proves by the absence of the circular bow that this is not caused by a reduction of one of the two phases rather than a reduction of residual Si or a zone of compressed gas. 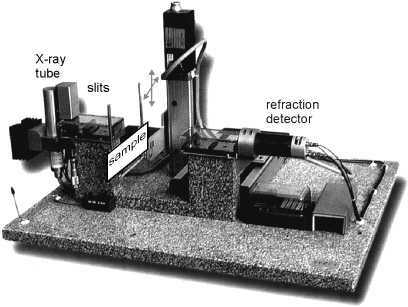 In order to gain orientational information on a sample at different positions a rotating slit is installed between the sample and a large area detector, as shown by figure 4, left. At each sample position a full rotation of the slit is performed, which reveals the polar intensity distribution by a 'Rotation Profile' within a few seconds. Figure 4, top right, gives the Rotation Profiles of polypropylene PP and liquid crystal polymer LCP (injection moulding samples). The width at half maximum (FWHM) is called the texture angle. In case of the polymers and carbon fibers it is correlated to the stiffness and strength of the material. Repetition of the Rotation Profiles at different scan positions gives the data for Rotation Topographs as presented by Figure 4, bottom, right. The horizontal coordinate is the rotation angle and the vertical direction corresponds to the sample position. The bright intensity maxima give directly the average polymer chain direction which is the direction of the highest possible load on the component. The technique has been applied for quality assesment of helicopter parts  and for carbon fibre orientation measurements in composite laminates for satellite microwave reflectors at a precision of + 0.1 degree. For some practical applications, like evaluating the flow pattern of injection moulding parts, it is often sufficient, to image solely the changes in orientation by Texture Topography: The rotation slit is fixed at an inclination angle of maximum slope of the rotation profile. While the sample is scanned any changes in texture and preferred orientation result in intensity changes. The Texture Topograph of two halfs of tensile test samples (LCP, injection moulding) reveal spatial variations in molecular orientation (Figure 5). The reported topographic methods can be very significant, especially in the case of thin walled components and when an average information along the traversing X-ray path is sufficient. However an additional transversal resolution would be the ultimate step to gain real three-dimensional information. X-ray Diffraction Microscopy provides a topographic image of a transversal section. The beam geometry is given in Figure 2, top right. The basic principle requests very narrow beam collimation of the incident and the diffracted rays. For practical use focussing single crystals fulfill this task perfectly, even at an acceptable intensity level. The transversal resolution is 0.4 mm, the lateral resolution is 0.05 mm (Mo-k-a radiation) . With Synchrotron radiation and slit collimation we have reached about 40 µm transversal resolution . Figure 6 shows the transversal cut through a CFRP laminate, were only one fiber direction is imaged. Another advantage of the method is the direct localization of the inspection area in a large component without rotation as necessary for Computer Tomography. Fig 6: Transversal cut through a CFRP laminate by Synchrotron Hard X-ray Diffraction Microscopy; one layer (fibrer bundle) direction imaged selectively. Another original development at BAM is X-Ray Refraction-Topography. It makes use of the well known optical effect of refraction at interfaces, which for X-rays happens at small scattering angles of a few minutes of arc. In a commercial Kratky camera a very narrow X-ray beam traverses a sample, which is scanned in the surface plane and scattering intensities are taken at all positions (Figure 2, bottom, left). The technique provides nearly linear contrast by inner surfaces and interfaces . In order to gain 2-dimensional images (at a possible spatial resolution of about 10 µm x 300 µm) a ceramic sample is scanned across the narrow primary beam. The method is called "X-Ray Refraction Topography". Usually the strong intensity of the X-ray refraction signal allows scanning the samples within relatively short time. Between 0.1 and 5 seconds per sample position are required for 2 % signal to noise ratio depending on the sample absorption and the inner surface concentration. A typical example of X-Ray Refraction Topography is given by Fig. 7. It shows SiC ceramic samples, the green body state GS (left, 44 % porosity) an intermediate state IS (middle, sintered at 1900 °C, 16 % porosity) and the ceramic state CS, sintered at 2180 °C (right, 3 % porosity). The computer images of Fig.7 represent the spatial mean pore size distributions. Absolute scaling of the images permits a reliable comparison in the course of the different stages of sintering. The images clearly indicate a reduced pore size homogeneity over the whole sample after treatment at higher temperatures. The most significant difference is found at the transitional stage from GS to IS. After this first step of densification the mean pore size varies from 0.55 µm at the outer region to a distinct concentration of 0.75 µm around the center of the sample. When the ceramic state CS is established, local clustering occurs due to a considerable disintegration. The mean pore size reaches (2.1 + 0.5) µm. The decomposition of the statistical arrangement of different pore sizes into clusters of similar pore sizes as imaged by Fig. 7, might be an essentially new effect for a better understanding of the properties of ceramics. Other interesting application of Refraction-Topography are the imaging of the crack density of polymers after aging or the study of single fibre debonding of fibre composites after fatique. A commercial table top refraction scanner makes the technique available to industrial laboratories (Figure 8). A limitation of Refraction-Topography is the averaging of the interface signals over the wall thickness of a sample. But a transversal section image can be achieved by a combination of Refraction line scans and Computer Tomography techniques according to the geometry given by Figure 2 (bottom right). A section of a C/C ceramic matrix composite is investigated in order to image the different crack patterns as developing during processing after the fibre/matrix bonding of the green body has been modified between "good" and "bad" bonding. At first a classical density map by Section Computer Tomography (CT) is created: At zero scattering angle multiple linear scans of the sample are repeated at different inclination angles about an axis perpendicular to the incident beam. The absorption signals can be reconstructed according to the rules for "parallel beam filtered back projection" as shown by Figure 9, center. The resulting transversal cut reveals major cracks and highly homogeneous density. If the same procedure is repeated with the detector slit at a small scattering angle of three minutes of arc, an interface image results (Figure 9, right) which contrasts a significantly higher number of cracks. The average intensity level reveals a quantitative crack density. The methods of X-Ray Topography request preferably the application of 'soft' X-rays below 20 keV. As their absorption in metals is high the restriction to light weight materials is recommend in most cases. The most frequent requests for topographic investigations come from industrial developments of polymer processing, plastic foams, composites, ceramics and special papers. Harder radiation of higher brilliance at synchrotron radiation facilities will provide faster topographic measurements and higher resolution in the near future.